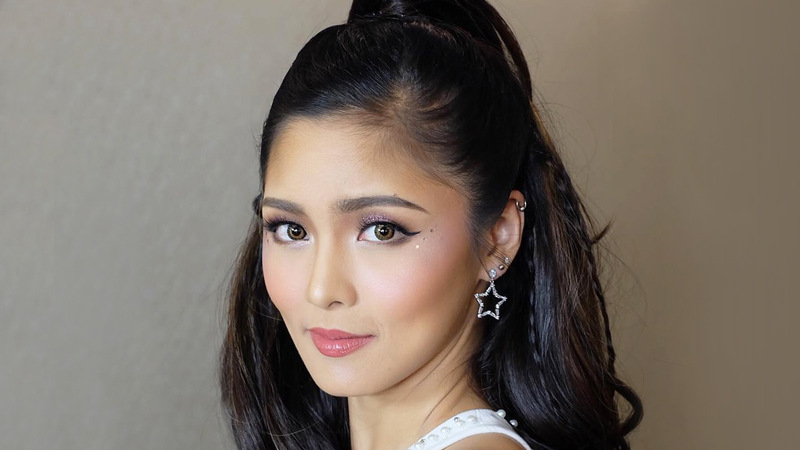 When Kim Chiu goes glam, she goes all out, especially when it comes to her hair. One of our fave 'dos is her flawless high half ponytail. Like most celebs, she has topnotch hairstylists at her beck and call, but sometimes, Kim has to do the work herself, too. During a show in Canada, Kim revealed how she does her hair without a hairstylist or a curling iron—it's honestly mind-blowing. She started by parting her hair and French-braiding the pieces at the back to serve as the extensions' foundation. She left some pieces in front, which she later on combed back to blend her natural hair with the extensions. The result? A glam, high ponytail! Just look at the difference it made! According to Denise Aquino-Posadas of Tokyo Posh, Kim wore the Ebi Chan half-wig—a style that has natural-looking waves—which usually costs P3,750. If you want a more affordable option, though, Tokyo Posh's clip-on bangs and hair extensions cost anywhere between P1,150 and P3,350. They're all "made of Japanese synthetic fiber, so the best thing about that is that they look natural, like human hair, but they're not as expensive as human hair extensions," said Denise. If you're wondering how Kim kept her extensions tangle-free, Denise adds that the best way to store the hair is by keeping them in a box or in a Tokyo Posh hair jacket. (Which looks like a coat jacket, but you know, for hair.) She also recommends to comb the hair before storage.